Tag line: "BACK FROM THE DEAD!" Now here’s a film with a great pedigree! Aside from featuring horror icon Boris Karloff in the lead role, 1936’s The Walking Dead was directed by none other than Michael Curtiz, who, despite the occasional foray into the genre (Doctor X, Mystery of the Wax Museum), is best known for such high-profile classics as The Adventures of Robin Hood, Casablanca, and Yankee Doodle Dandy. As you might expect, this actor / director collaboration resulted in one hell of a motion picture. Karloff is John Ellman, a concert pianist framed by a criminal organization for a murder he didn’t commit. Within moments of him being put to death in the electric chair, evidence surfaces proving Ellman’s innocence, at which point Dr. Beaumont (Edmund Gwenn) quickly retrieves his body and, with the help of an experiment he’d been conducting, brings Ellman back to life. At first, the zombie-like Ellman can’t remember who he is or what’s happened to him, but before long, his memory returns, causing him to seek revenge against the crooks who brought about his untimely demise. Much like his monster from the Frankenstein series, Karloff’s Ellman is a very sympathetic character, and we find ourselves rooting for him as he stalks those responsible for his death. In one of the film's best scenes, Ellman, having been recently resurrected, is sitting at a piano, giving an impromptu concert (at Dr, Beamont’s request) to show a gathering of stunned spectators what he’s capable of. Suddenly, his eyes dart around the room, focusing on those whose actions led to his execution. As the camera pans back and forth from one criminal to the next, director Curtiz focuses squarely on the faces of these guilty men, some of whom are squirming uncomfortably in their seats. Though he’s only indirectly responsible for many of the deaths that follow (one crook drops dead of a heart attack brought on by fear), we're satisfied that justice has been served, making Karloff’s Ellman that rarest of characters: a film monster who’s also the hero of the story. 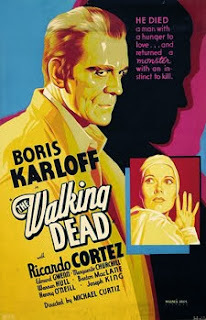 A stylishly directed movie, The Walking Dead provided Karloff with one of the most interesting roles of his career, and this alone makes it a must for all fans of classic horror.